Contrary to what one unrepresentative study found, the city’s workers are actually benefiting from the wage hike. What happens when wages go up? Workers make more money. It seems intuitive, but now we have proof of concept. It’s happening in one of the first major cities to delve into the $15 wage experiment. 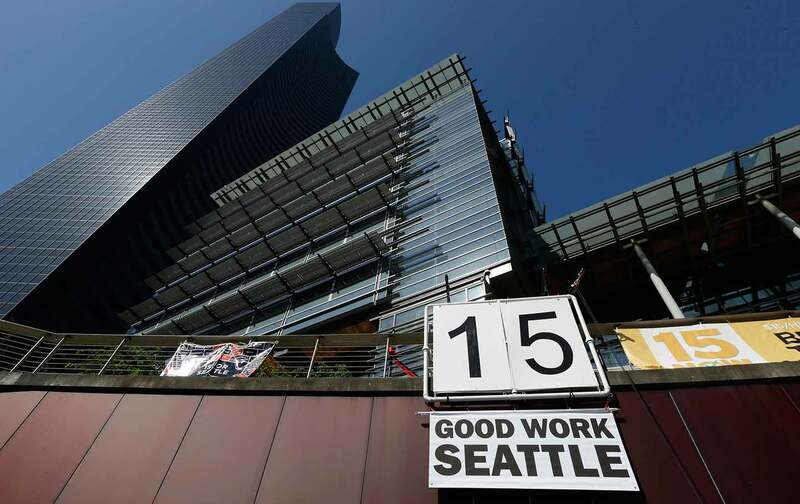 In April of 2015, Seattle implemented a new law that raised the city’s hourly base wage, with the ultimate target of reaching $15 per hour by 2021. The slow phase-in, which has increased the minimum wage each year at different levels depending on various factors like the size of the company paying a given worker, would eventually be indexed to inflation. In 2017, the increases finally began reaching the full $15 base wage, and now the nationwide “Fight for 15” campaign is finally bearing fruit in the industry where the mobilizations began: restaurants. The study, by University of California-Berkeley’s Institute for Research on Labor and Employment (IRLE), tracks the policy’s initial implementation phases, starting with firms with 500 or more employees without insurance. Other researchers found that, at least for restaurant workers, bosses are complying with the law, and workers benefit. Much of the improvement accrues to so-called “limited service” restaurants (such as fast-food franchises), where some of the poorest workers, in the most precarious positions, are concentrated. The researchers also stress that food-service workers are generally reflective of other local low-wage workers, like retail workers, indicating that similar industries would also see gains as the $15 hourly wage is phased in. There are, of course, naysayers. A recent University of Washington study argued that Seattle’s wage hike would actually hurt workers overall because an hourly increase would be offset by a reduction of workers’ hours and decreased employment. But IRLE researchers and others challenged that study as excessively limited in scope, based on an unrepresentative sample of workers. The Berkeley researchers contend that their analysis focuses on material impacts in a more representative sector. Nationwide, eight other cities and eight states, including California and New York, are implementing minimum-wage increases in the $12-to-$15 range, eventually impacting several million workers. Boosted by election-season grassroots campaigns, a bill for a national $15 minimum wage was recently introduced by Bernie Sanders and other progressive senators, reflecting the energetic mobilizations of Fight for $15 campaign groups over the past several years. An earlier IRLE analysis projected that in California a $15 base wage would increase earnings for “5.26 million workers, or 38.0 percent” of the statewide workforce. The vast majority of these workers would be over age 20, and nearly half would have some college education. The beneficiaries would be primarily Latino workers, disproportionately working only part-time jobs, and who would be less likely to currently have workplace health benefits. In the long-term, the additional wages would strengthen workers’ families as well, through increases in parents’ and children’s health and school achievement. The Seattle study suggests that as $15-an-hour wages roll out, concrete gains will go toward workers in at least one major service sector. And, despite what conservatives argue, the raise would likely take only a tiny bite out of your restaurant bill. “The price of your hamburger isn’t completely deterministic by minimum-wage workers and what they make,” Allegretto says. “It has to do with rent, it has to do with how much the food actually costs, it has to do with transport.” So any price increases would ultimately be much less than the added benefit to wages. And why not ask consumers to pay a few pennies more on the dollar if “that helps them cover the cost of the increase in the minimum wage without having to lay off workers”? The findings may seem obvious, but minimum-wage rates on both the state and federal levels have sunk to irrational levels since the government first instituted the concept of a “minimum wage” during the Depression, seeking to reverse the downward spiral of poverty and mass unemployment as employers ruthlessly exploited a surplus of desperate job seekers. Since then, state and federal minimum wages have regressed absurdly. The current federal minimum, arbitrarily set at the starvation rate of $7.25 an hour, is basically unsustainable for a worker’s family anywhere in the country. Had the floor simply risen with inflation over the past 50 years, it would be worth about $19 an hour today. In other words, even $15 amounts to a depressed base wage compared to the more realistic, inflation-adjusted national standard. In Seattle’s King County, with its extreme income inequality, a single parent of two would need to make about $34.50 an hour to cover basic needs. Daycare costs alone can consume $1,600 a month of a typical restaurant worker’s income. Other complexities of Seattle’s economy make it even harder to get by; the prevalence of part-time jobs without benefits, low union representation, and classification of short-term workers as “contractors” so they don’t qualify as wage-earning employees. One unprecedented regression in Seattle’s law aims blatantly to placate businesses: The law introduces a tipped-wage credit for full-service restaurants. Though the offset is smaller in Seattle than the federal standard, as well as that of many others states, the new $1-to-$2 credit benefits employers by telling them to pass additional labor costs to customers, so diners subsidize low wages, whether those diners end up being cheap or generous in their tips. The findings suggest that the workers in food-service jobs with a regular hourly wage would see a larger economic benefit than bartenders and waitstaff typically would. Despite the Seattle law’s breaks for business and slow phase-in (the real value of the $15 wage itself will have eroded by 2021), IRLE’s research helps further bolster the case for the reasonableness of $15 an hour with concrete evidence that restaurant workers do okay at $15 an hour. And a look around Seattle shows that its restaurants seem to be chugging along.